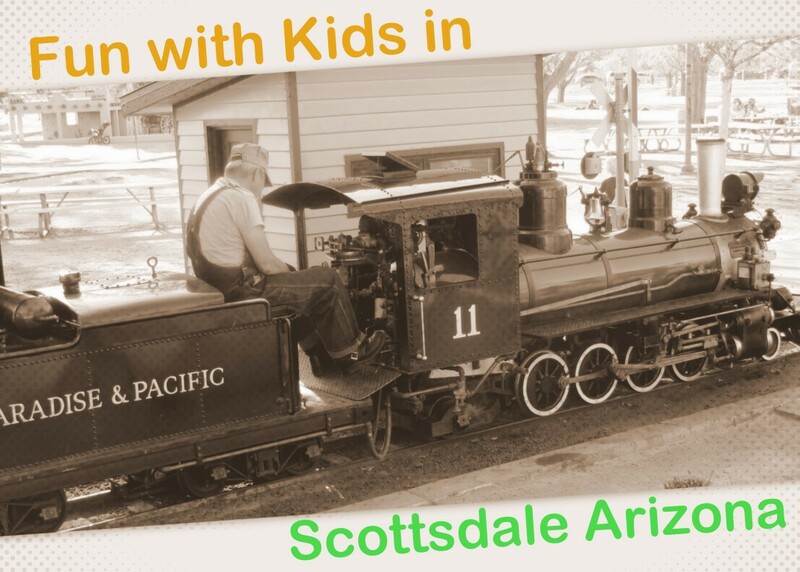 You are here: Home / Arizona Locals / Visit Scottsdale Arizona with Kids! 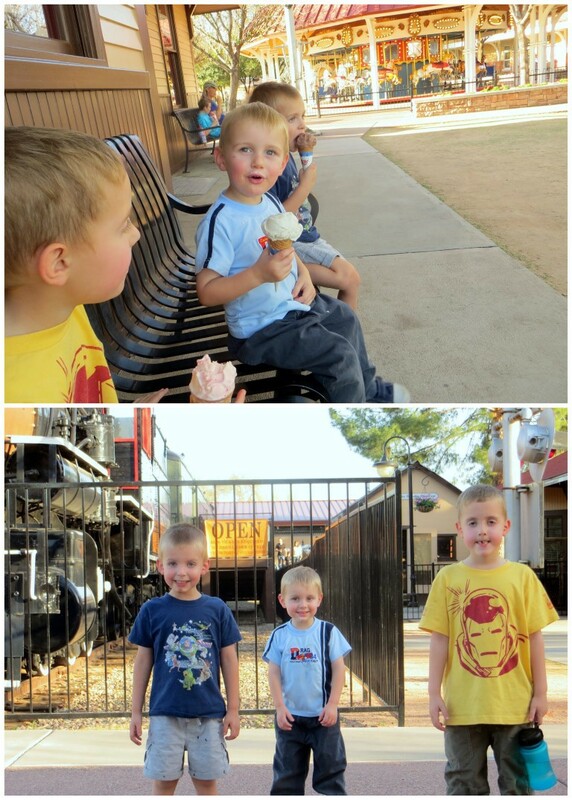 This past month we planned a special fun filled day in Scottsdale Arizona with our kids in tow. We have lived in the Phoenix, Arizona valley for over eight years and have really enjoyed exploring all the different things to do right here in the valley! We’ve seen a variety of cities and attractions but wanted to spend a date dedicated to checking out some of the great attractions that families might want to visit on a trip to Scottsdale to show you just a peek at why you might want to come and enjoy sunny Arizona! We started off our fun filled day with a trip to Dave & Busters, a family friendly arcade that also serves food, too. This was our kids’ first time to an arcade. When we told them where we were going to go first they were really excited and said, “Like in Wreck-It Ralph?” My kids were in awe when we walked in with all the lights, tons of games, and lots to see and do. We played classic skeeball, a nascar race game with actual mini cars you raced around a track, air hockey, motorcycle racing game, and others. The boys loved riding on the life-like motorcycles and would bust up laughing when their character in the game would do all sorts of cool tricks with each big jump. We had a blast playing as a family on a 4-player Air Hockey table. Their favorite game, though, was the Nascar miniature racing cars that they are still talking about! Dave & Busters is located in the Northern part of the Phoenix valley just out of the Scottsdale city limits. It’s part of the really nice outdoor shopping center called Desert Ridge. We could have spent a lot of time there as the was a really good variety of games but we had a full agenda so we headed off to our next stop, the movies. Since our boys are really young we thought a visit to Studio Movie Grill in North Scottsdale would be the perfect place to grab lunch and enjoy an animated film. We got tickets to see Escape From Planet Earth which was a really fun movie that we all really enjoyed. Studio Movie Grill serves food to your seats with a waiter if you came for a movie and a meal or snacks. We ordered up some lunch and our boys stayed happy through the whole film eating up their meal and finishing it off with some yummy popcorn. Studio Movie Grill does not allow children under the age of 3 to attend movies PG13 rated or higher after 6 pm, so keep that in mind if you are traveling with a young child. After our trip to the movies, we headed over to McCormick-Stillman Railroad Park in Scottsdale to burn some energy and enjoy the beautiful springtime weather. We’ve been to this park before, in fact we love to visit in December and get to visit with Santa on one of the real Trains! This is such an awesome park, though, that it is on the top of our list of things to do every time we head to Scottsdale! They have a really large playground with slides and climbers sized just right for every age and stage. They also have a carousel and a train ride that are $2 per ride. Most of the train’s cars are open but they do have two boxcars that the kids can ride in, if they prefer. My boys choose the boxcar while my husband, youngest, and I all rode in the next car up where we could still see their excitement, but ride more comfortably. The Stillman-McCormick park also has a western town the kids can climb up to the top of the building, pretend they are in the jail cells, and climb into the stagecoach. After all the fun activities, we always visit the ice cream shop at the park. You can get a single or double scooped ice cream cone for pretty cheap and the flavors are really yummy! 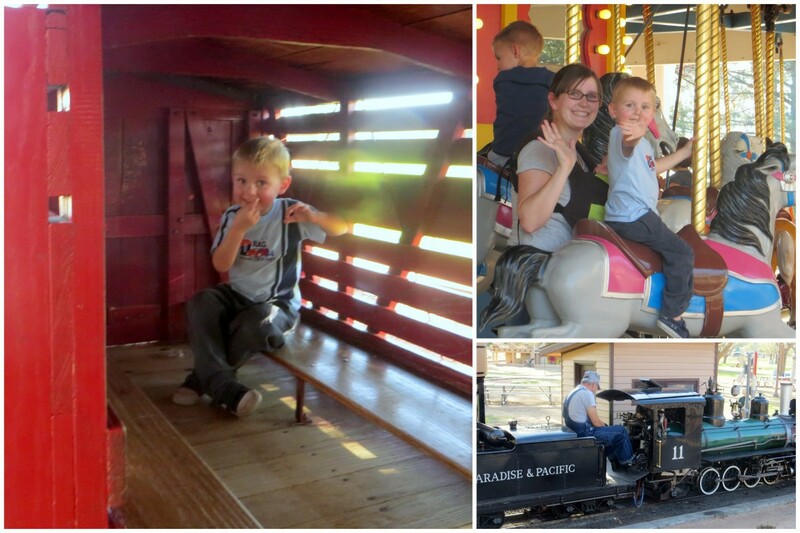 Finally, we strolled around looking at the real life trains and hopping along the train tracks. The park also has a model train museum with to scale models of the different cities around Arizona. This is one of the best parks in all of Arizona and a must do if you are traveling with little ones. When finished off the day by heading the short distance to Mesa, Arizona to watch the Easter Pageant production put on at the LDS temple. 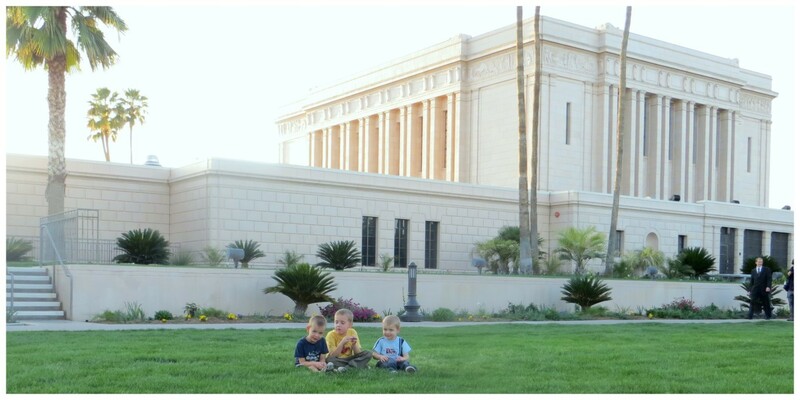 Our family loves to walk around the temple and see the reflection pool, fountain, cactus display that shows a ton of varieties of cactus and see the displays in the visitor center. This year, we also got to watch the pageant on its opening day and we all really enjoyed the show and my 4 year old was really excited to meet one of the cast members, a Roman solider. Rawhide Western Town has a gunmen show featuring stuntmen and tricks that is really fun to watch. They also have attractions like rock climbing, panning for gold, stagecoach rides, and more. Phoenix Zoo has over 1,000 animals including 200 endangered species. Our favorite is the walk through monkey exhibit which is similar to the bird exhibits where you get to go right into their habitat and watch the little monkeys jump through the trees. Hole in the Rock is a quick hike right next to the Phoenix Zoo that is short enough and has steps that even your kids can join in. Once you are at the top you walk through the hole in the rock to see a great view from the top overlooking the zoo and some of the city. MacDonald Ranch offers a petting zoo, free pony rides for children under five, horseback rides and stagecoach tours. Heard Museum can give you a taste of the culture of the Native Americans with hands on activities and a full scale replica of a Navajo dwelling. There are tons of other fun things you can do in Scottsdale and the surrounding cities. To find more information on the best times of the year to visit, more attractions, and recommendations on places to eat and stay, visit the Scottsdale Convention & Visitors Bureau. Connect with the visitor bureau for video clips on Scottsdale, seasonal events, and highlights on great attractions. Disclosure: I received a gift card to cover travel the attractions of our choice in exchange for posting about our experiences. Previous Post: « Easy Dinner Recipes: Tuna Casserole Recipe! I’ve never been to Arizona but Scottsdale sounds like the perfect place to visit. Thanks for the info! I have never been to Scottsdale but I have always heard good things about it from the people who have. Sounds like a fun day! I can see why kids like the boxcar, but I’d be with you and sit in the comfy adult-sized seating areas. Cute places to take kids though! this looks like a great place to visit with a family.